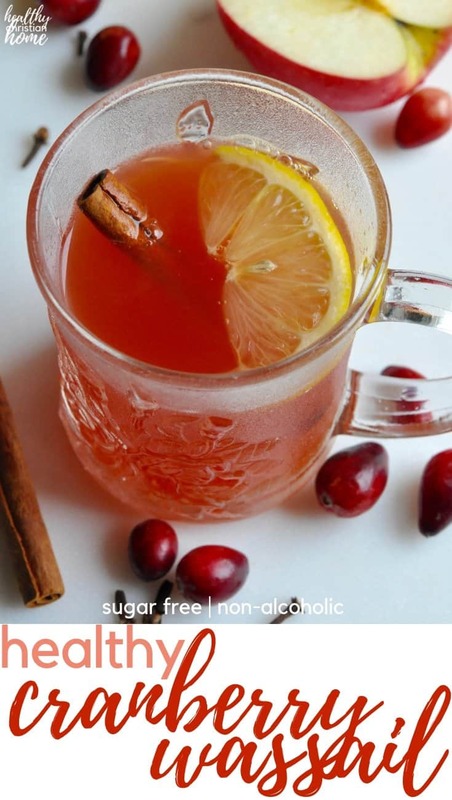 This cranberry wassail recipe is the perfect drink to serve at any holiday celebration, or just a cozy night at home. It’s sweet, tart, and tangy, with just the right amount of spice. 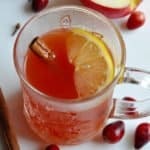 Cranberry hot wassail is a unique twist on my mom’s classic sugar free wassail recipe. In my opinion, the cranberry kicks things up a notch and turns your wassail a gorgeous festive red. It’s also very healthy with no sugar, non-alcoholic, and filled with nourishing spices and fruits. – The Wassail Song, 12th century England, author unknown. Apparently, wassail is an old-English word referring to the warm contents of a cup. My mom makes her comforting classic wassail recipe every year, and it’s one of my favorite things about going home for the holidays. There’s nothing cozier than drinking a warm mug of wassail and watching a Christmas movie. Her traditional wassail recipe includes apple juice, orange juice, lemon juice, and mulling spices. But today we are adding tangy cranberry to the mix! Lots of other wassail recipes include sugar to sweeten, but this one is perfectly sweet with the juice alone. This easy wassail recipe can be made on the stove top or crock pot. All you have to do is add the ingredients and heat gently, and it’s ready to serve! 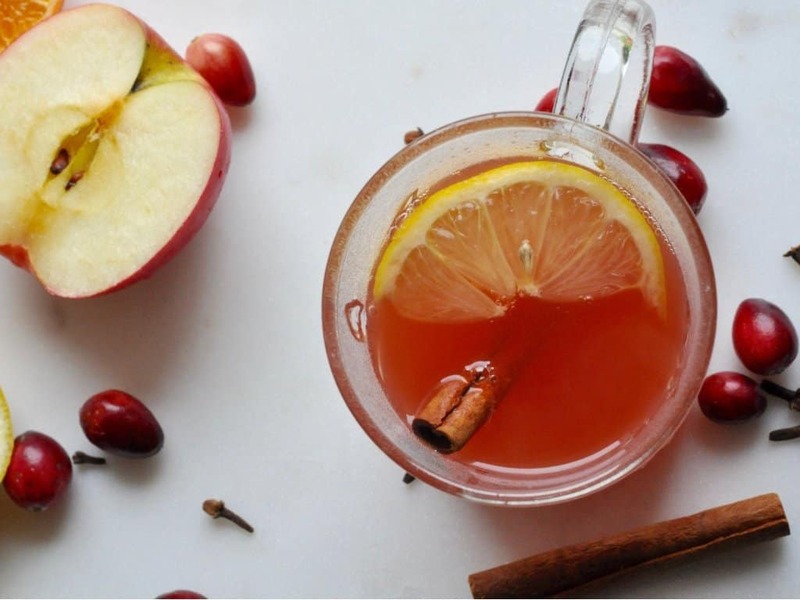 The healthy ingredients in this cranberry wassail recipe make it taste even better! It’s filled with fruit and antioxidant rich spices. These juices are full of vitamin C and other antioxidants, perfect for fighting off winter illnesses. You can use frozen, from concentrate or fresh juices. I definitely recommend fresh squeezed lemon juice. Cloves add the perfect element of warm spice and are also antioxidant-rich, antibacterial, and good for digestion, the liver, and blood sugar (source). Ginger is one of my favorite spicy flavors and its amazing for nausea and inflammation. It’s also cancer fighting, good for the heart, and regulates blood sugar… is there anything it can’t do (source)? A little goes a long way with this bold yet delicious spice. It’s actually a potent pain reliever and is known to improve sleep and brain health (source). Not only is cinnamon delicious, it’s also amazing for oral health, skin health, allergies, and also inflammation and blood sugar stabilization (source). 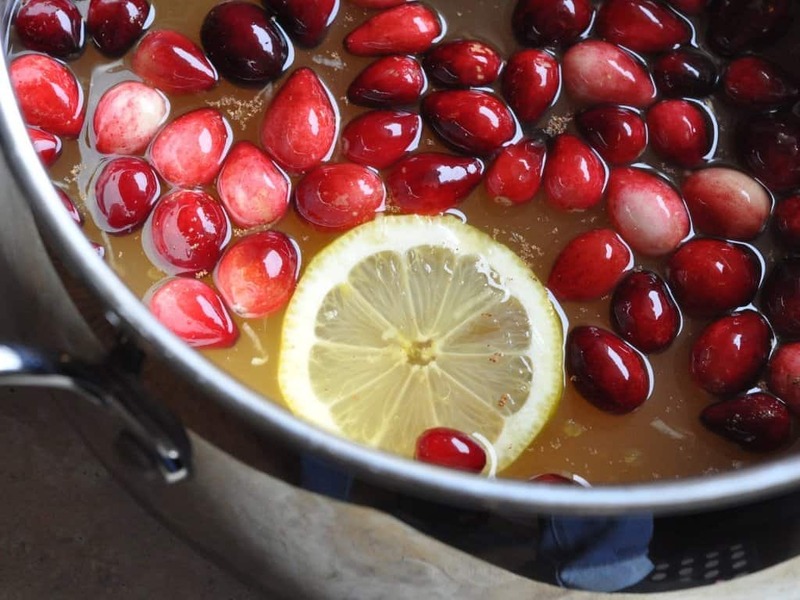 Adding cranberries to the mix makes this recipe very unique and even more holiday-esque. I’m loving the tartness and color they bring to this hot wassail! Cranberries are also filled with antioxidant phyto-nutrients, good for controlling blood sugar and improving cardiovascular health, according to World’s Healthiest Foods. Some studies have also shown cranberries to be great for urinary tract health. It’s too bad we typically only eat them once a year! I tried to find cranberries in grocery stores at the end of August to decorate my healthy pumpkin roll and couldn’t find a single one. So if you have any cranberries left over, be sure to freeze them and use them in smoothies or other recipes. 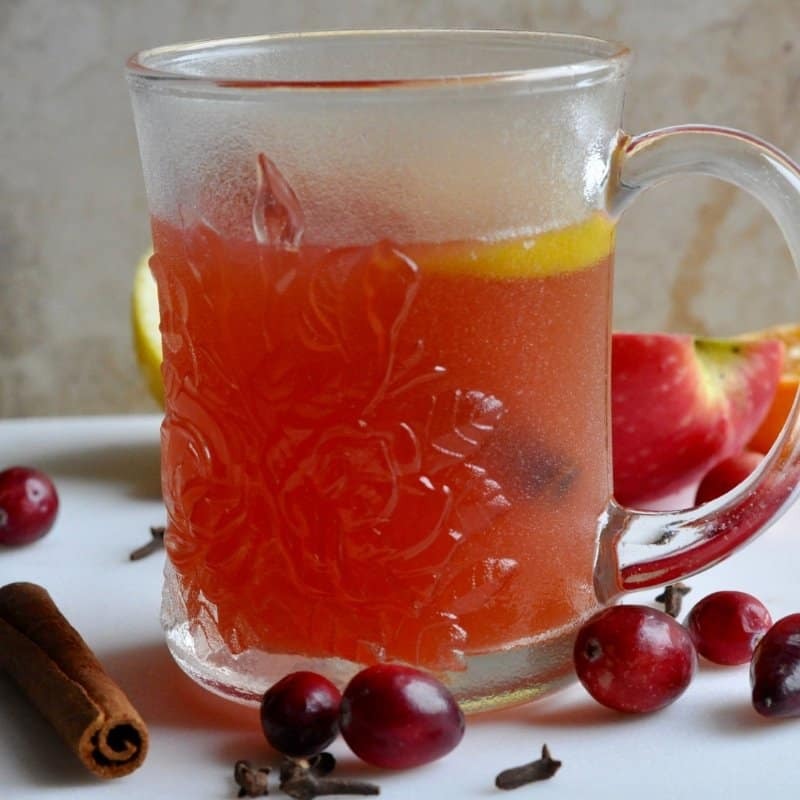 BTW – this cranberry wassail would be the perfect companion to a healthy pumpkin roll! Or, if you want a richer holiday drink, try Homemade Non Alcoholic Eggnog! To some, this wassail may be a bit tart. I love how the tartness and sweetness balance each other out. But, if you like it sweeter, you could always add some raw honey to balance the cranberry or go back to traditional wassail. This recipe is supposed to be simmered for at least an hour to allow the flavors to meld. I was in a hurry so I could take photos and accidentally let it boil for a while! It still turned out great. You’ll know the wassail is ready when the cranberries start to burst and release all their yummy goodness. There’s no need to mash them – your wassail will turn a gorgeous red without any effort. Make sure to strain before serving for best results. For fun, serve with a cinnamon stick to stir and a lemon or orange slice! 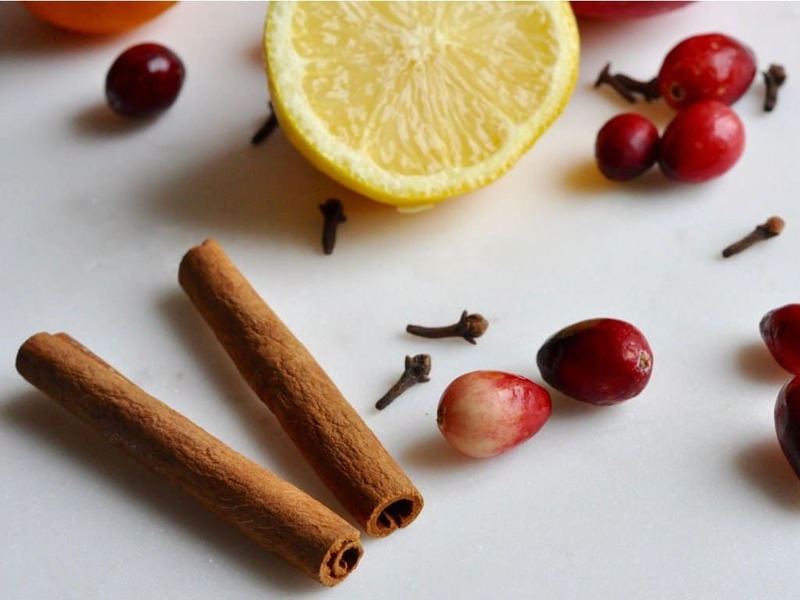 This cranberry wassail recipe with apple, citrus, warm spices, and tangy cranberry is the holidays in a cup! It’s also healthy – non alcoholic & sugar free. Add all ingredients into a large pot or crock pot. Heat gently. Allow wassail to simmer for at least one hour for flavors to meld together. It can be simmered up to 4 hours. Are you crazy for cranberry? Try Lacto-Fermented Cranberry Apple Relish and Ginger Spiced Fresh Cranberry Sauce with Orange! 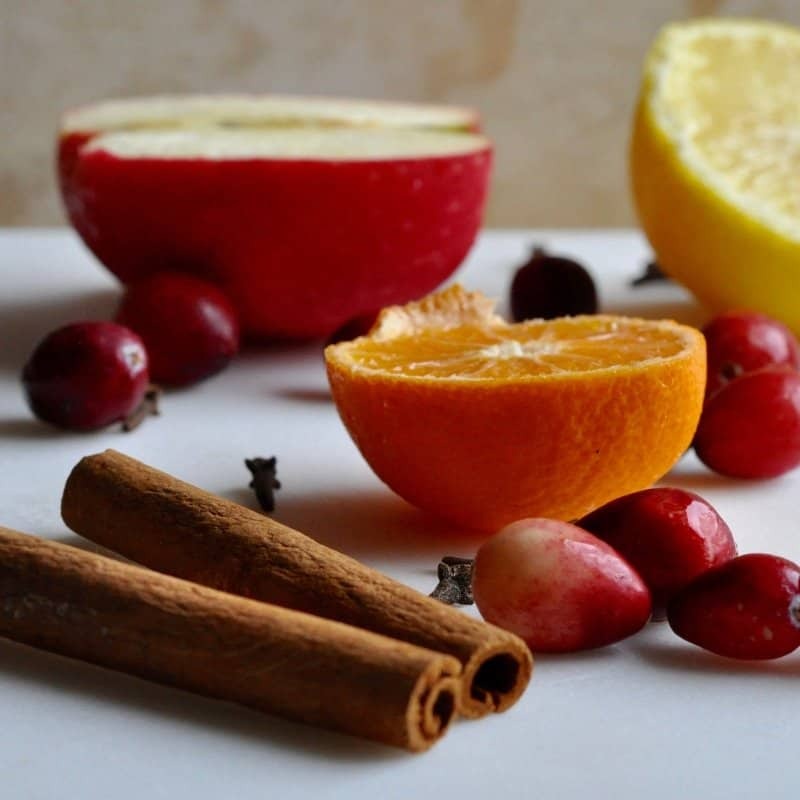 Or, if you want your home to smell even more Christmassy – create a Holiday Simmering Potpourri! Can I ask a favor? If you enjoy this recipe, could you leave a recipe rating in the comments section? I’d really appreciate it! What’s your favorite holiday recipe? Please pin this post and help spread the wassail-cheer!